Melissa & Doug Classic Deluxe Kitchen $99.99 w/ Free Shipping! Another amazing Amazon deal! 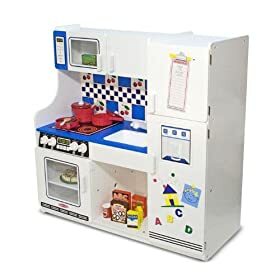 Melissa & Doug Classic Deluxe Kitchen is on sale for $99.99 with free shipping (regular $249.99). You can still get another $30 off if you haven’t done the Amazon Credit Card deal yet. It was $99 with free shipping in January of 2009 (when the post was written) and if you click the link in the post you will be taken straight to the page with the kitchen. It is currently up to $188, but there may be another sale at some point. Next post: WAHM Sample & Coupon Giveaway Winners!